The whole world has become infatuated with global warming and the concept of their carbon footprint. So, it is not unusual that this phenomenon has also affected the yarn industry. Whether its yarn, projects, or color, the eco- friendly obsession has definitely found its place in the knitting community. 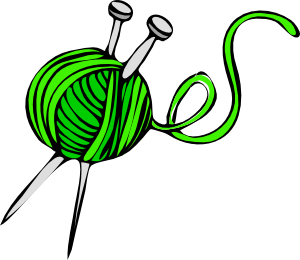 Many non- knitters tend to view hand knitting as “green” on its own. Crafts, in general, seem to get the “hippie” reputation, but there are still many ways to make your knitting become a bit more eco- friendly. Unless you have your own sheep or farm to produce your yarn, or the time to create natural dyes from the left over fruits in your fridge, you may want to check out some of these yarns. Many companies have become much more conscious in providing their clientele with more eco friendly options. However, there are many other ways to stay green and eco conscious in the knitting world. How about trying to take apart old sweaters and scarves that haven’t been worn in years? Go local- there are local farms everywhere that produce one of kind yarn that is usually un-dyed or unprocessed. Most farmers’ markets have yarn for sale! Think outside the box for yarn options: Hemp and soy are great “green” yarns. 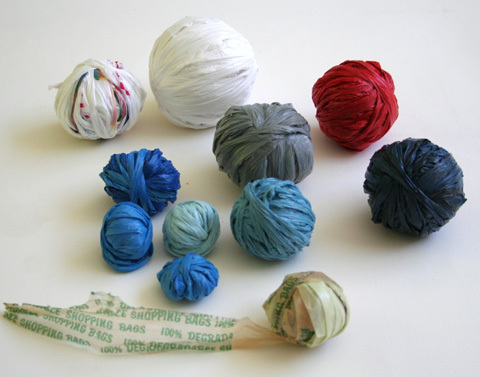 There are even knitters who recycle old plastic bags for use as knitting fiber. 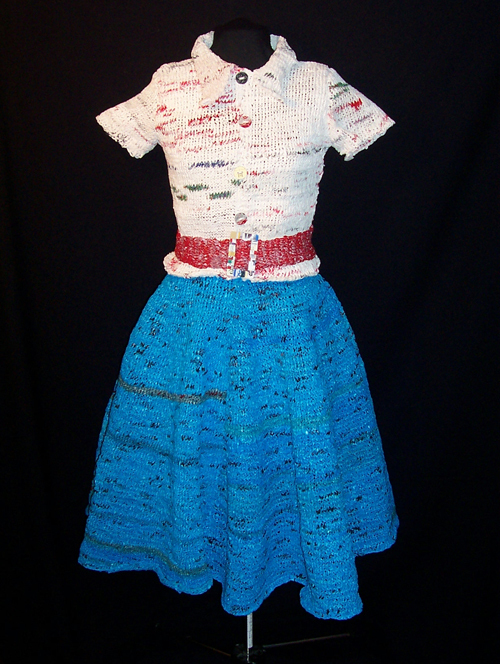 Entire Garment Knit from Plastic Bags! So take the time to explore the green side of knitting the next time you choose a project. But don’t forget it is still “green” to make your own garment. Another fabulous reason to keep on knitting! This entry was posted in Theblackstitch Blog and tagged color, crochet, eco, fashion, fun, green, knit, knitting, organic, style, sweater, yarn. Bookmark the permalink.